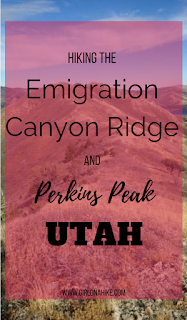 Even though the Emigration Canyon Ridge and Perkins Peak is located directly on the watershed line, dogs are not allowed. Other areas are right on the watershed line yet dogs are still allowed (such as Clayton Peak), so I'm not sure why this one is off limits. I'll refrain from putting my own opinion in about how I feel about this issue...anyway, be aware that there are several "No Dog" signs, and there are usually cops hanging out at Little Mountain Summit. It is a popular area for bow hunters, so the cops are mainly there to keep an eye out for poachers, but that doesn't mean they won't tag people for bringing dogs on the trail. 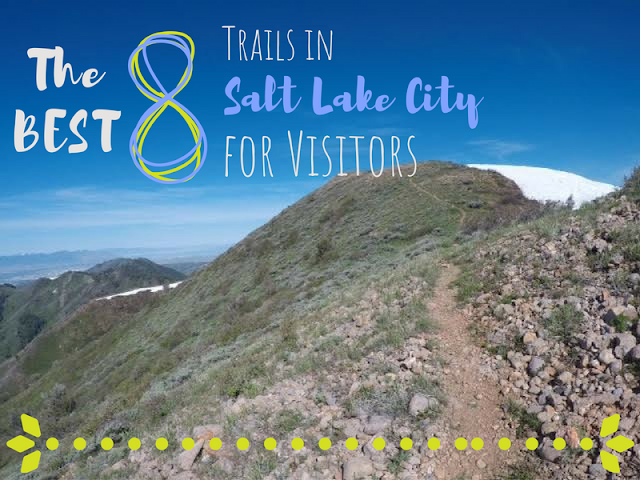 This route is accessible and safe year round, though Summer may be less than ideal simply because there is zero shade. 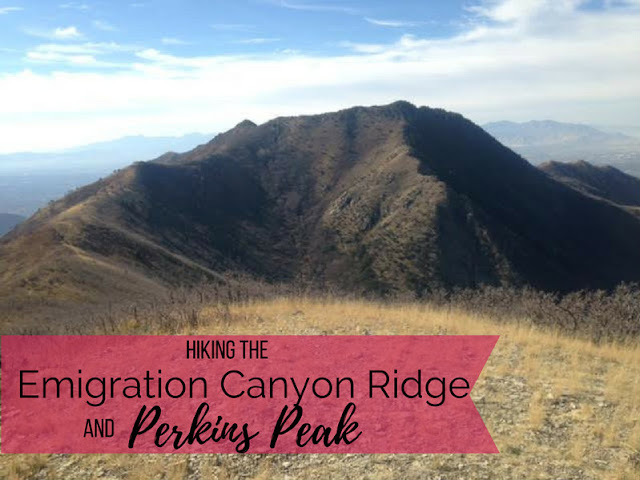 Dale & Perkins Peak would be a great "into to peak bagging" summits for beginner peak baggers since hiking along the ridge is super easy (minus a few steep spots up to the peaks). 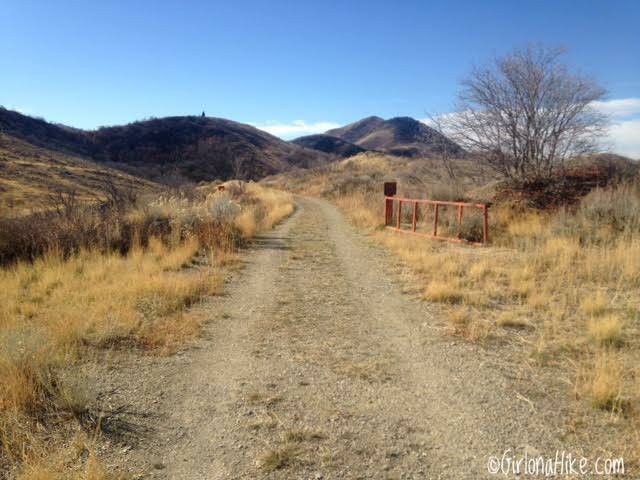 For all you Wasatch Mountain Wranglers out there, this would be an awesome trail run! From SLC head East on 800 S, all the way past Foothill Blvd, which turns into Sunnyside Blvd. You'll pass the Hogle Zoo and Ruth's Diner on your right. 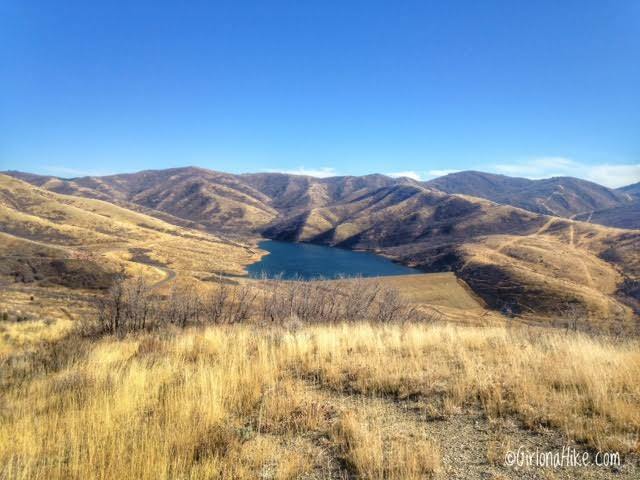 Drive all the way up Emigration Canyon until you reach the Little Mountain Summit on the saddle. The large parking lot is on your right (South), and can fit about 40 cars. The TH begins right behind the restroom. Here is a driving map. 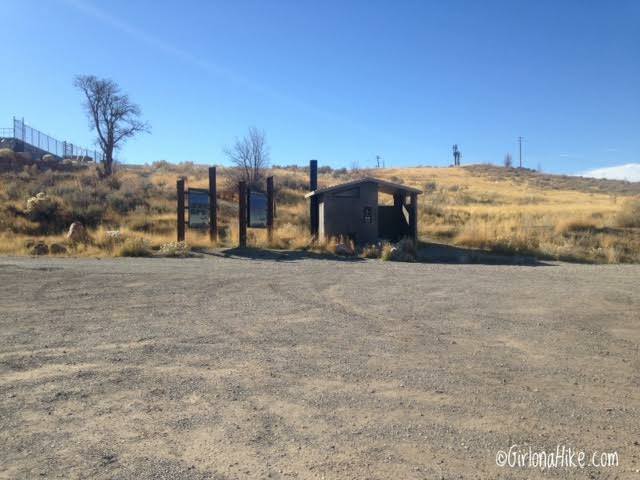 The trail starts behind the restroom, in between the Watershed sign. 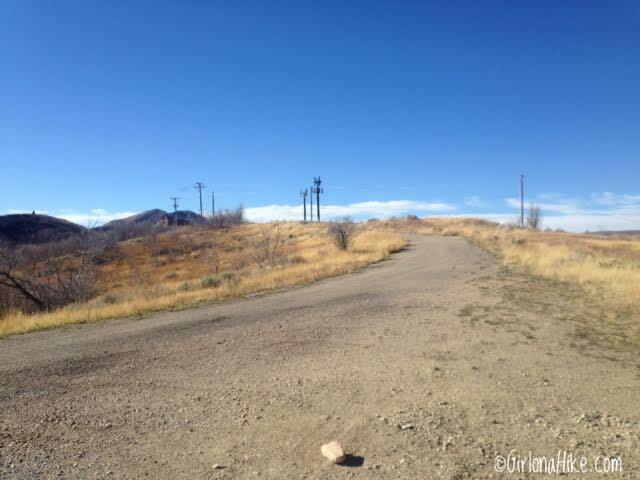 The first 3/4 mile follows the wide paved road past all the utility buildings, and passes by several electricity and cell phone towers. Not the prettiest view starting out. Pass by an old red gate. You'll see trails splitting off to the right side, which will take you around the hills. 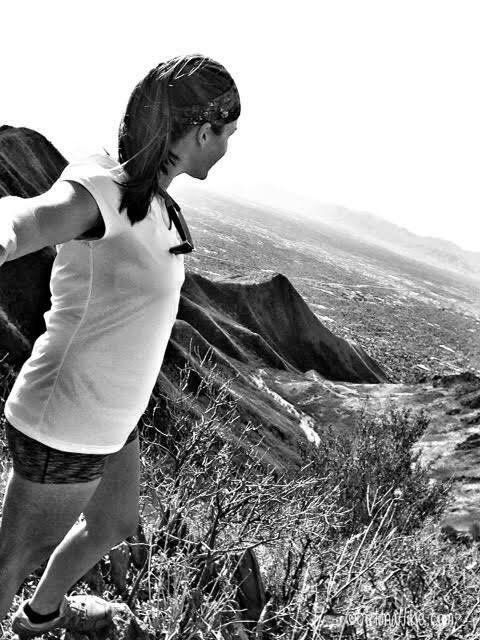 We chose to hike up and over all the hills to get in more of a workout. 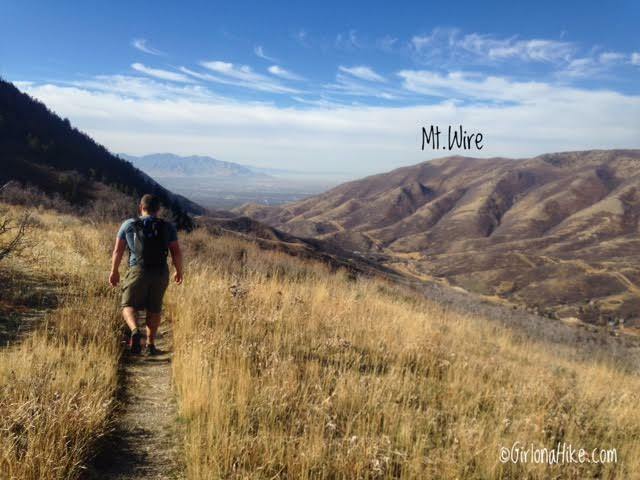 Beginners may not like all the up and down, so if you are new to hiking or need an easier day, take the side trails. Looking back (East) to Little Dell Reservoir. Continue following the old jeep road. 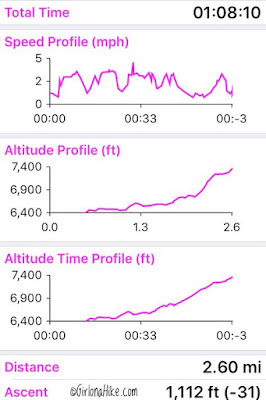 You should now clearly be able to see your first destination - Dale Peak. Some maps and guides will refer to it as the Dale Benchmark. It's a high point, so I'm sticking with "peak." The trail can be very brushy at times with scrub oak. The trail gets really steep for the next 20 minutes or so. It's a mix of hard and loose rock. As long as you have shoes with good, grippy tread you should be fine. Don't wear shoes with all the tread gone. 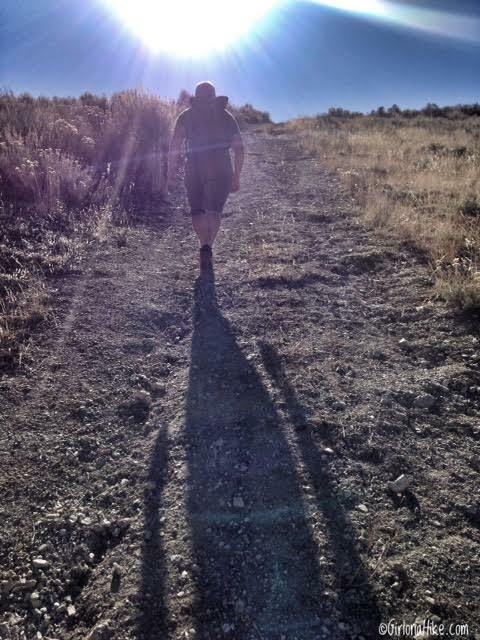 We both wore our Inov-8 Mud Claw 300s on this hike, which is a trail running shoe with amazing tread. As soon as I got to a flat part, I thought I was on the peak! It was the false summit! Keep going until you reach the high point. Finally on Dale Peak with a panorama looking south. I-80 is below in the canyon, and Grandeur Peak & Mt. Aire are clearly visible from this spot. We reached Dale Peak in just over 1 hour. 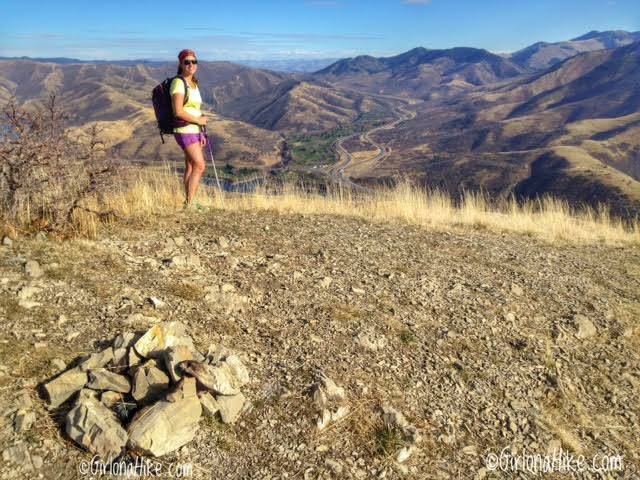 This would be a good turnaround spot if you only had 2-3 hours to fit in a hike or a quick 1 hour run. Did anyone notice that I'm wearing shorts and a t-shirt....in mid-November?! This warm weather has been crazy this year. Last year this time of year I was hiking in a foot of snow! 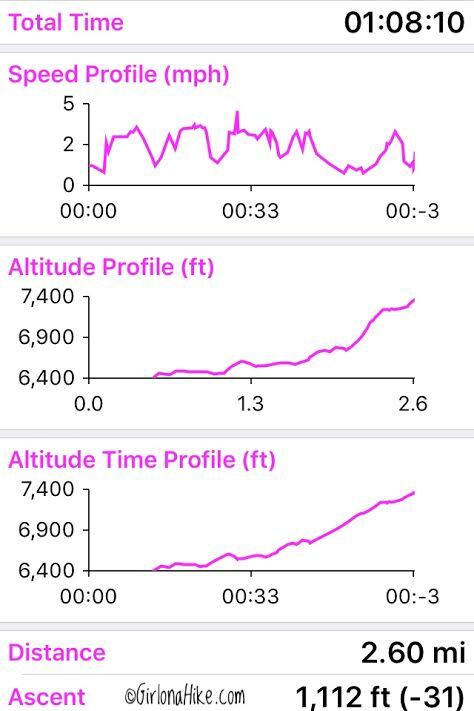 Trail stats for Dale Peak. 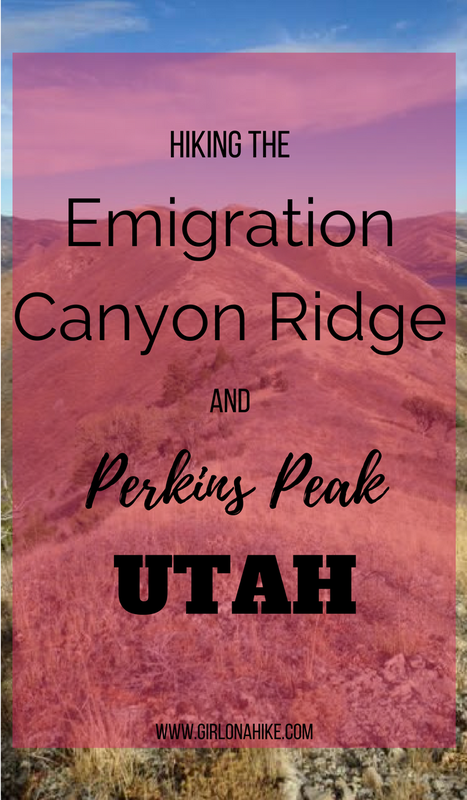 To continue along the Emigration Canyon Ridge and over to Perkins Peak, simply continue West along the ridge. The trail is well defined. 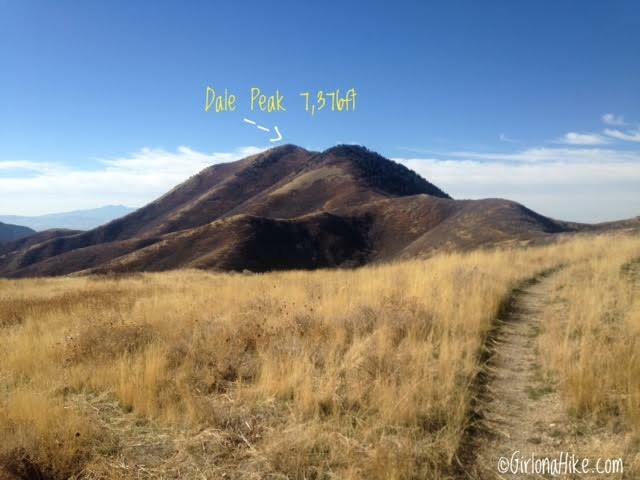 Hiking to Perkins Peak will take you about another one hour from Dale Peak. Panorama from Dale Peak looking North. Soon after we dropped down from Dale Peak, we saw a cow moose right off the trail. 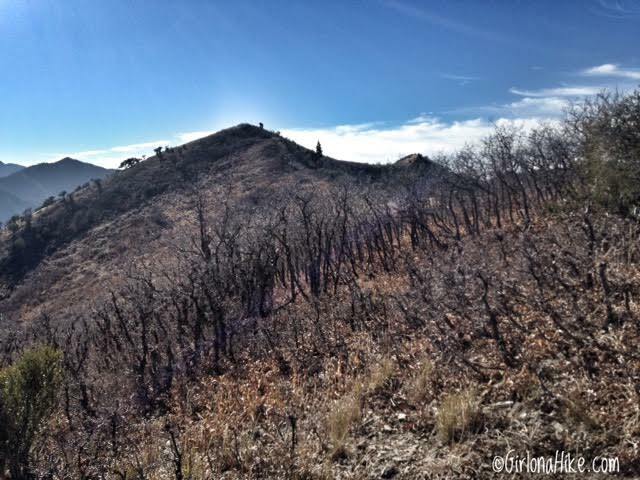 As you get to the base of Perkins Peak, you'll see the trail split and also fade very quickly. Keep left and follow the now faint, game-looking trail to the saddle. 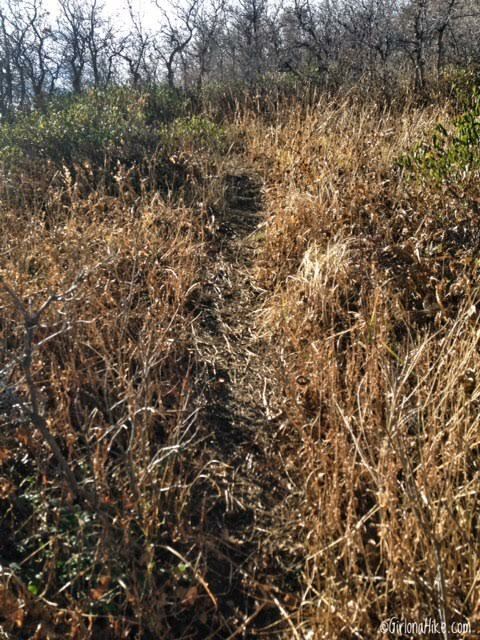 Once you get to the saddle, look for another very faint trail off in the bushes and turn right. 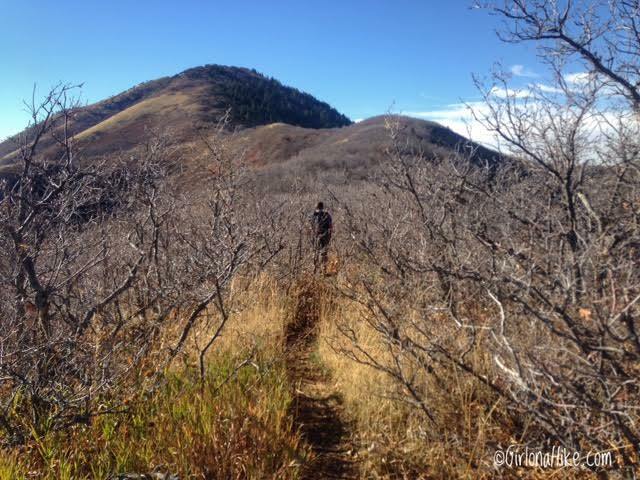 Follow this small trail up to the ridge, which leads you to Perkins Peak. 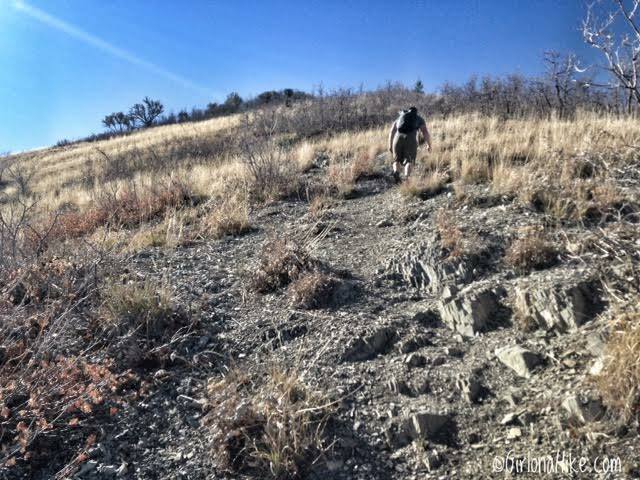 On the ridge heading towards Perkins Peak. Once you reach this section there is a tiny bit of scrambling. 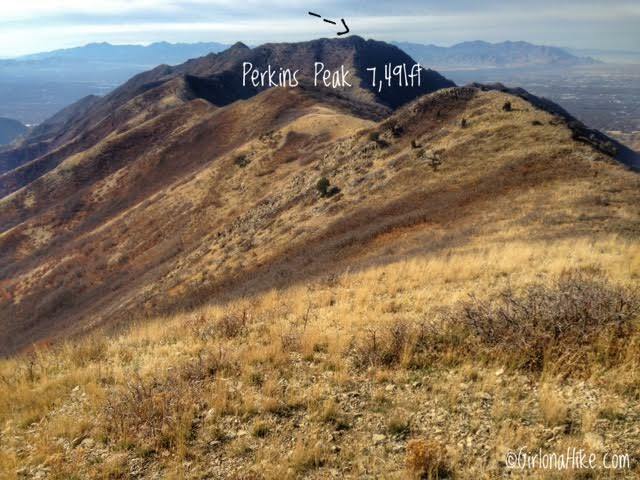 On Perkins Peak, my 40th peak this year! Woot woot! I have hiked up Jack's Mailbox Peak (the peak in front of me) so many times and looked up to this ridge, wondering how to get up there. Finally, I can say I've been up there! The canyon below me is private property, so hiking isn't allowed up that way to this ridge. Panorama on Perkins Peak looking down canyon to Jack's Mailbox Peak. 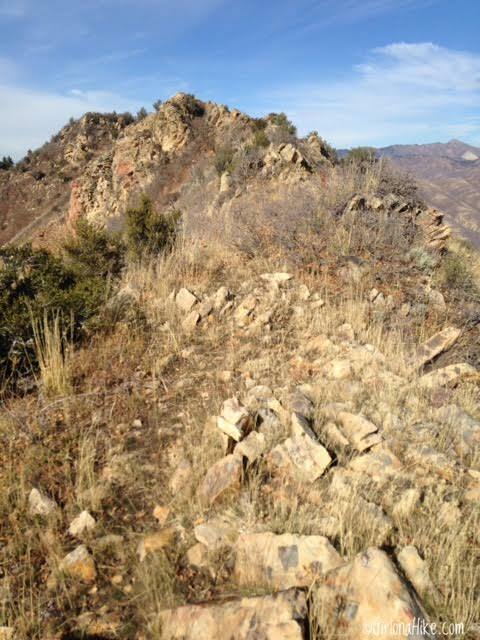 South Perkins Peak is the high point to the left, which you can also access from this same trail. Just go back to the saddle and continue West. We decided to skip it since we were short on time. 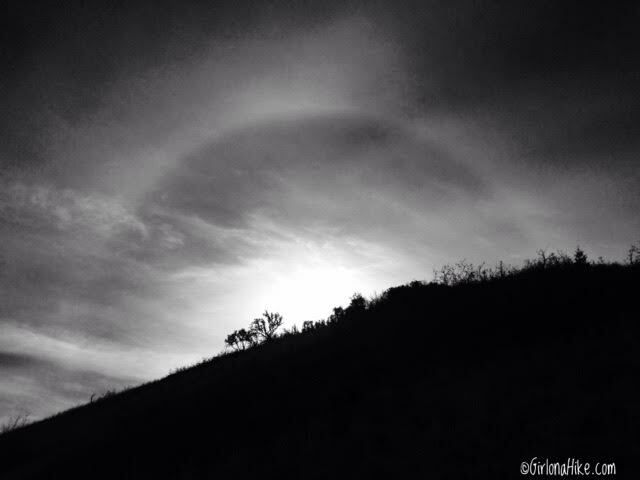 Sundog showing as we were coming off the peak. A Sundog is a bright, colored patch of light that forms on either side of the sun when it's low in the horizon. Sundogs are named so because it "sits" beside the sun (like a loyal dog attends its owner). The scientific name is "parhelia." Ironic that we saw a "sundog" where dogs aren't allowed haha. I highly recommend wearing pants on this trail. 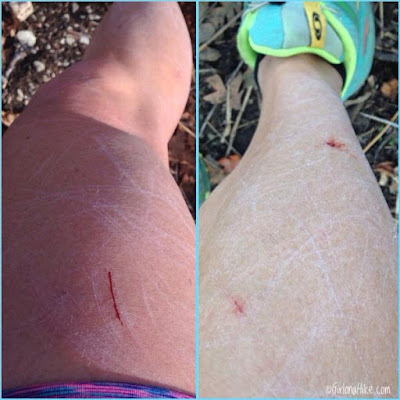 My legs got cut up from all the scrub oak along the trail. I didn't think it was that bad until I saw I was bleeding in three different spots from it. After awhile, my legs started to feel sore from all the oak brushing against me. Back to the car in just over 4 hours.